More than 100,000 alumni chose UMSL. We'll show you how to join them. Ready to be a Triton? The Office of Undergraduate Admissions can help you on your path to earning a degree from UMSL. Whether you're joining UMSL from a community college or a four-year institution, the Office of Transfer Services can help. The Graduate School offers more than 30 master's programs, 15 doctoral programs, and a wide variety of graduate certificates. The Office of International Student & Scholar Services advises international students from over 70 countries. At UMSL, you can have it all. Our diverse student body has access to world-class researchers and scholars, top-ranked degree programs and sought-after internship opportunities. In short, we offer a serious education at a serious value. 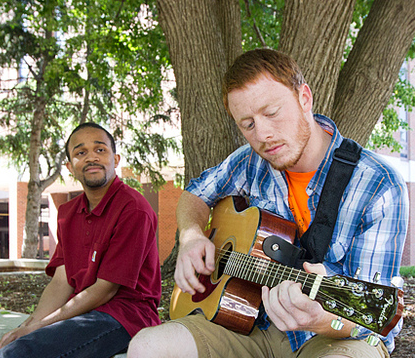 UMSL provides a great environment for students to learn, make friends, and explore new interests. With more than 100 student organizations, an active Greek Life, community service opportunities, leadership programs and multiple cultural events, there is always something to do on campus. The campus also offers students several housing options to meet their needs. Whether you live in a campus apartment or traditional residential hall, living on campus is convenient, fun and a great way to meet people. Check out Residential Life to learn more and don't forget to schedule a campus tour and see for yourself what UMSL has to offer you. The University of Missouri-St. Louis is accredited by the Higher Learning Commission. This accreditation applies to all baccalaureate, masters, and doctoral levels.